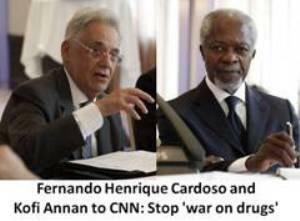 In an op-ed on CNN.com published Tuesday, former UN Secretary General Kofi Annan and former Brazilian President Fernando Henrique Cardoso called for governments around the globe to decriminalize drug possession and find more effective and humane ways of regulating drugs. "Each year, hundreds of thousands of people die globally from preventable drug-related disease and violence," they wrote. "Millions of users are arrested and thrown in jail. Communities all over the world are blighted by drug-related crime. Citizens see huge amounts of their taxes spent on harsh policies which are not working." Both men are members of the Global Commission on Drug Policy, which, building on the work of the Latin American Commission on Drugs and Democracy, has called for a paradigm shift in global and national approaches to drug regulation. "We called on governments to adopt more humane and effective ways of controlling and regulating drugs," the two statesmen noted. "We recommended that the criminalization of drug use should be replaced by a public health approach. We also appealed for countries to carefully test models of legal regulation as a means to undermine the power of organized crime, which thrives on illicit drug trafficking." Now, they said, momentum is on the side of reform. They cited advances in South America, Europe, and even the United States, where two states legalized marijuana last year and where marijuana decriminalization has picked up steam in the past decade after going on hiatus after the 1970s. That such globally renowned figures are calling for a radical restructuring of approaches to drug regulation is evidence that the global dialogue has definitively shifted, said Ethan Nadelmann, executive director of the Drug Policy Alliance. "The Global Commission, led by President Cardoso, has played a pivotal role in transforming global dialog about drug policy," said Nadelmann. "Its influence will only grow now that Kofi Annan has embraced drug policy reform as a personal priority both globally and with respect to the work of his foundation in Africa. Policy options that were readily mocked and dismissed just a few years ago are now integral to planning for a 21st Century global drug control regime to replace the failed prohibitionist regime of the last century." Q: How do you get Presidents, Prime Ministers and Secretaries General to support drug policy reform? A: EASY!! You merely have to wait for their terms to expire. Formerly powerful people love to endorse rational solutions if they think it can get them back in the spotlight they so desperately crave.